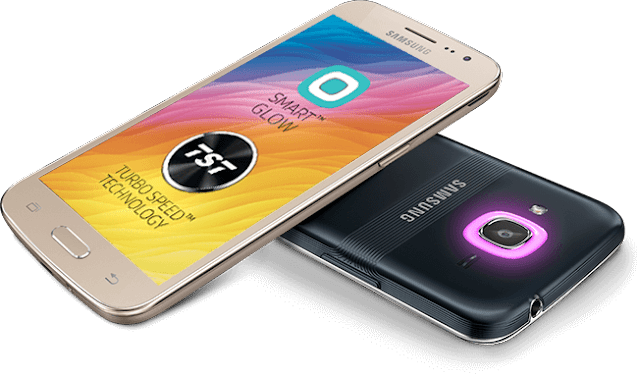 Combining fast performance and longevity, Turbo Speed Technology enables the Galaxy J2 Pro to make optimum use of resources for a faster experience. It deactivates unnecessary background apps, de-clutters and organizes the memory so that the phone loads apps up to 40% faster than devices with double the RAM. With an advanced notification system, Smart Glow allows you to assign a customized colour to the LED Notification Ring. By color-coding contacts, apps and phone usage alerts, it keeps you up to date on every important notification. What’s more, Smart Glow even lets you take great selfies with Selfie Assist feature. With 1.5GHz Quad Core Processor and 2GB RAM, the Galaxy J2 Pro is powered to perform. Shuffling between multiple apps is easier as the processor manages all functions efficiently to make your experience seamless. With colours and contrast so vivid, the sAMOLED display in the Galaxy J2 Pro takes your breath away. Spectacular and vibrant colours pop from the bigger 12.7cm (5 inch) High Definition screen to dazzle your senses. With 8MP + 5MP (Rear + Front) camera, the Galaxy J2 Pro takes photos that are picture perfect. What’s more, you can take fantastic selfies from the rear camera with Selfie Assist feature that enables face detection cues and focus lock before taking the picture. For those who want it better and faster than ever before, the Galaxy J2 Pro provides the ultimate 4G experience. Browse, stream and play at blazing 4G speed, all the while saving data with Ultra Data Saving Mode.